Download "WITS. 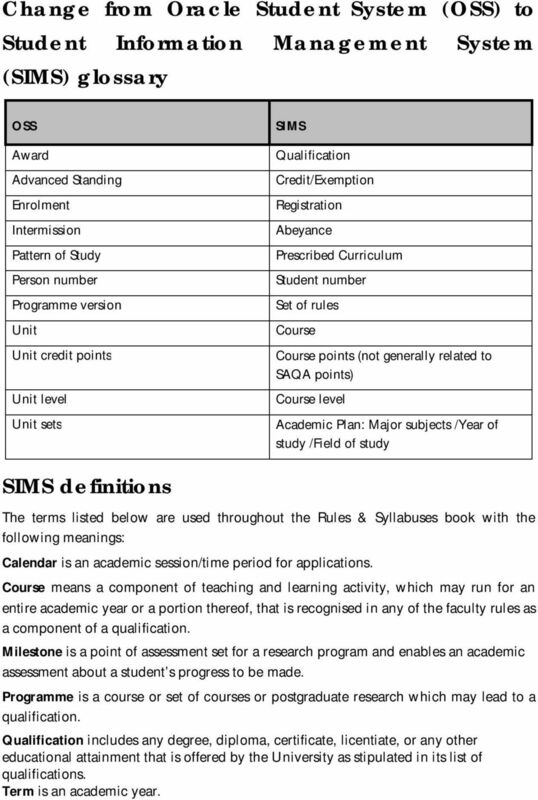 Rules & Syllabuses. 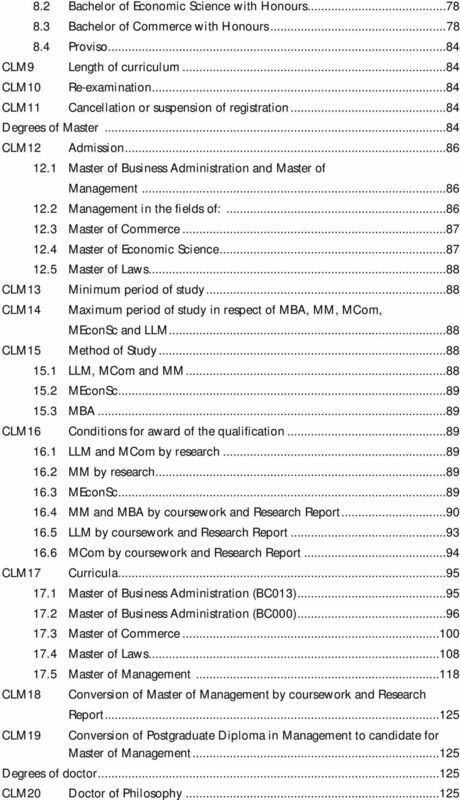 Commerce, Law and Management. 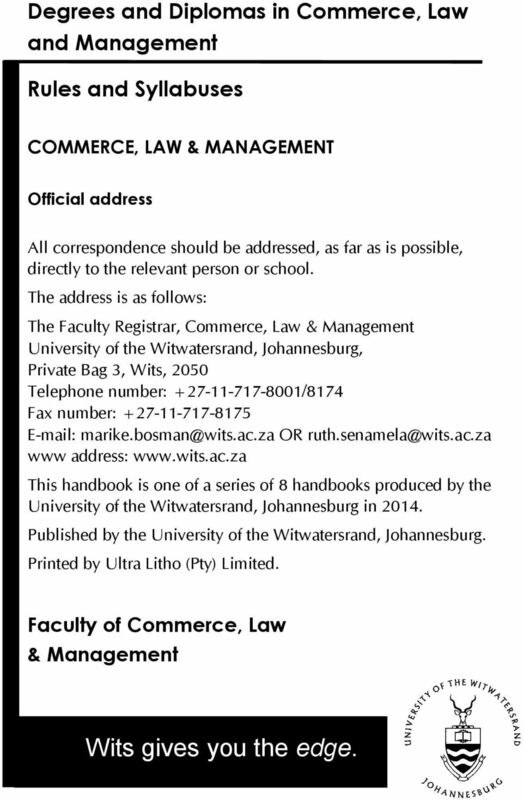 Commerce, Law and Management 2014. www.wits.ac.za"
2 Degrees and Diplomas in Commerce, Law and Management Rules and Syllabuses COMMERCE, LAW & MANAGEMENT Official address All correspondence should be addressed, as far as is possible, directly to the relevant person or school. 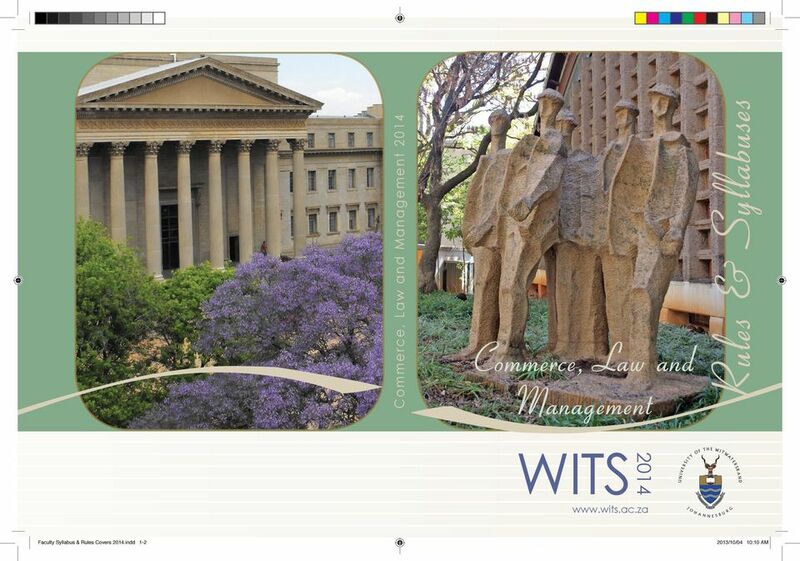 The address is as follows: The Faculty Registrar, Commerce, Law & Management University of the Witwatersrand, Johannesburg, Private Bag 3, Wits, 2050 Telephone number: /8174 Fax number: OR www address: This handbook is one of a series of 8 handbooks produced by the University of the Witwatersrand, Johannesburg in Published by the University of the Witwatersrand, Johannesburg. Printed by Ultra Litho (Pty) Limited. Faculty of Commerce, Law & Management Wits gives you the edge. 10 Change from Oracle Student System (OSS) to Student Information Management System (SIMS) glossary OSS Award Advanced Standing Enrolment Intermission Pattern of Study Person number Programme version Unit Unit credit points Unit level Unit sets SIMS Qualification Credit/Exemption Registration Abeyance Prescribed Curriculum Student number Set of rules Course Course points (not generally related to SAQA points) Course level Academic Plan: Major subjects /Year of study /Field of study SIMS definitions The terms listed below are used throughout the Rules & Syllabuses book with the following meanings: Calendar is an academic session/time period for applications. Course means a component of teaching and learning activity, which may run for an entire academic year or a portion thereof, that is recognised in any of the faculty rules as a component of a qualification. Milestone is a point of assessment set for a research program and enables an academic assessment about a student s progress to be made. Programme is a course or set of courses or postgraduate research which may lead to a qualification. Qualification includes any degree, diploma, certificate, licentiate, or any other educational attainment that is offered by the University as stipulated in its list of qualifications. Term is an academic year. 12 General Rules G e n e r a l R u l e s 1 Introduction The rules contained in this section are the General Rules of the University and apply to all students. There are also specific rules for each Faculty, which are subordinate to the General Rules. On registering at this University the student bears the responsibility of ensuring that s/he is familiar with the rules applicable to her/his registration. Ignorance of these rules will not be accepted as an excuse. All Rules and Syllabuses are available online. Limited copies are also available in print format and on CDs. All words appearing in italics have been defined. Where information is presented in the shaded boxes, it is intended as explanatory only. G1 Definitions 1.1 Academic year means the period determined by the Senate from time to time for any particular year of study for any particular qualification. 1.2 Admission means entry to a course or qualification unless it is indicated otherwise. 1.3 Any university or any other university means any university recognised by the Senate for the purpose under consideration. 1.4 Applicant means a person who has submitted an application in hard-copy or electronic format to become a student of the University. 1.5 Assessment means the process of judging learning and may have both a formative and/or summative nature. 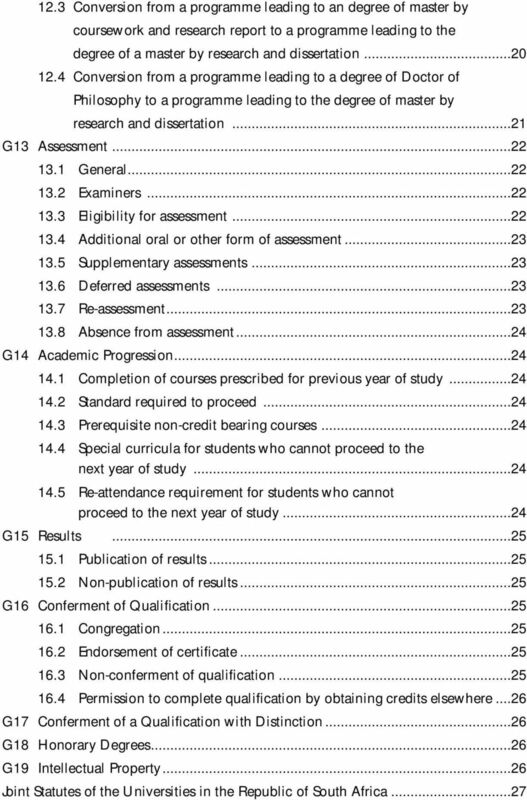 1.6 Auxiliary pass (also referred to as ancillary pass or condoned pass, unless the contrary appears in the faculty rules) means a special type of condonation of a failing mark to a pass when no supplementary assessment is offered, so that the course will be included as a credit towards the qualification but the student may not proceed to a higher level course in that subject. 1.7 Candidate/Postgraduate student (see G1.18) means a student registered for a higher qualification (see G1.14). 1.8 Course means a component of teaching and learning activity, which may run for an entire academic year or a portion thereof, that is recognised in any of the faculty rules as a component of a qualification. 1.9 Credit means the recognition that is obtained when a student passes such assessments and complies with such conditions as the Senate may impose for the completion of each course. A credit towards a qualification may be granted to a student in respect of a credit obtained from another institution recognised by the Senate for this purpose or from another faculty within the University. The plural includes the singular where the sense so suggests. 13 2 G e n e r a l R u l e s 1.10 Curriculum means a course or combination of courses leading to a qualification Dissertation is the term reserved for an extended piece of written work that makes a contribution to the advancement of knowledge that may incorporate creative work or publications integral to the argument, and is submitted in fulfilment of the requirements for a degree of master by research Examination and re-examination mean a formal, compulsory, summative, scheduled assessment Exemption from a course means that the Senate has deemed a student to have a sufficient understanding of the subject matter of that course to warrant the student not having to complete the course. An exemption is not a credit but allows the student to proceed to the subsequent level in a particular course. The full number of credits required for a qualification is not affected by the granting of an exemption Higher qualification means a qualification which requires at least the attainment of a first degree, or equivalent recognised by the Senate, at entry level and includes a degree of Bachelor with Honours Joint and/or Dual degrees mean a postgraduate degree (Masters and PhD), jointly offered by the University and an external non-south African partner institution, recognised by the Senate. Joint degree: a candidate shall receive a single co-branded degree certificate representing work completed at the University and a partner institution. Dual degree: a candidate shall receive a degree certificate from each of the partner institutions, representing work completed at the University and a partner institution respectively. 1.16a Matriculation means the formal recognition by Umalusi prior to 2008 in terms of any law, of the capacity of a student to enter a university. Umalusi is a council for quality assurance in the certification of qualifications in the general education and training band (Grades 0 to 9) and the further education and training band (Grades 10 to 12). 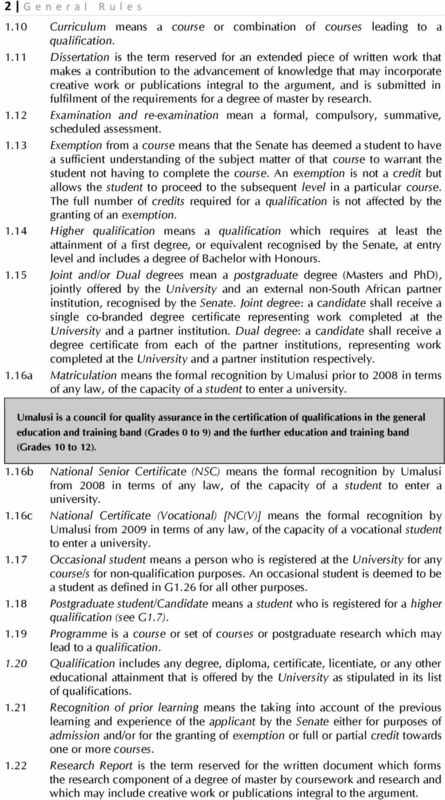 1.16b National Senior Certificate (NSC) means the formal recognition by Umalusi from 2008 in terms of any law, of the capacity of a student to enter a university. 1.16c National Certificate (Vocational) [NC(V)] means the formal recognition by Umalusi from 2009 in terms of any law, of the capacity of a vocational student to enter a university Occasional student means a person who is registered at the University for any course/s for non-qualification purposes. An occasional student is deemed to be a student as defined in G1.26 for all other purposes Postgraduate student/candidate means a student who is registered for a higher qualification (see G1.7) Programme is a course or set of courses or postgraduate research which may lead to a qualification Qualification includes any degree, diploma, certificate, licentiate, or any other educational attainment that is offered by the University as stipulated in its list of qualifications Recognition of prior learning means the taking into account of the previous learning and experience of the applicant by the Senate either for purposes of admission and/or for the granting of exemption or full or partial credit towards one or more courses Research Report is the term reserved for the written document which forms the research component of a degree of master by coursework and research and which may include creative work or publications integral to the argument. 14 G e n e r a l R u l e s Semester is half an academic year Senate is defined in section 1 as read with section 28 of the Higher Education Act 101 of 1997 and is the body which governs the policies and procedures in respect of the teaching, learning, research and academic functions of the University. The Senate may delegate its powers except where expressly prohibited from doing so by the University Statute. G1.24 In many cases the powers of the Senate are, for practical purposes, delegated to and exercised by the deans of the faculties or, in specific instances their nominee/s Short course is a certified teaching and learning activity of less than 1200 notional study hours which does not, or does not directly, carry credit towards a qualification. With special permission of the Senate, short courses may carry credit towards a qualification. 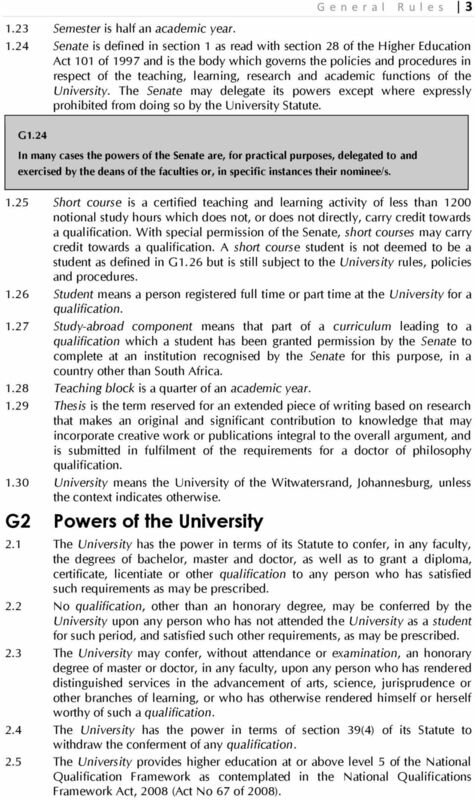 A short course student is not deemed to be a student as defined in G1.26 but is still subject to the University rules, policies and procedures Student means a person registered full time or part time at the University for a qualification Study-abroad component means that part of a curriculum leading to a qualification which a student has been granted permission by the Senate to complete at an institution recognised by the Senate for this purpose, in a country other than South Africa Teaching block is a quarter of an academic year Thesis is the term reserved for an extended piece of writing based on research that makes an original and significant contribution to knowledge that may incorporate creative work or publications integral to the overall argument, and is submitted in fulfilment of the requirements for a doctor of philosophy qualification University means the University of the Witwatersrand, Johannesburg, unless the context indicates otherwise. G2 Powers of the University 2.1 The University has the power in terms of its Statute to confer, in any faculty, the degrees of bachelor, master and doctor, as well as to grant a diploma, certificate, licentiate or other qualification to any person who has satisfied such requirements as may be prescribed. 2.2 No qualification, other than an honorary degree, may be conferred by the University upon any person who has not attended the University as a student for such period, and satisfied such other requirements, as may be prescribed. 2.3 The University may confer, without attendance or examination, an honorary degree of master or doctor, in any faculty, upon any person who has rendered distinguished services in the advancement of arts, science, jurisprudence or other branches of learning, or who has otherwise rendered himself or herself worthy of such a qualification. 2.4 The University has the power in terms of section 39(4) of its Statute to withdraw the conferment of any qualification. 2.5 The University provides higher education at or above level 5 of the National Qualification Framework as contemplated in the National Qualifications Framework Act, 2008 (Act No 67 of 2008). 15 4 G e n e r a l R u l e s 2.6 The University has the power in terms of its Statute and the Higher Education Act 101 of 1997 to determine the admission policy, the entrance requirements in respect of its curricula, the number of students who may be admitted for a particular curriculum or course and the manner of their selection and the minimum requirements for the readmission to a curriculum leading to a qualification in a faculty of the University. The University has the power to refuse readmission to a student who fails to satisfy such minimum requirements for readmission. 2.7 The University reserves the right not to offer a particular course or qualification notwithstanding that such course or qualification appears in the rules of a faculty. 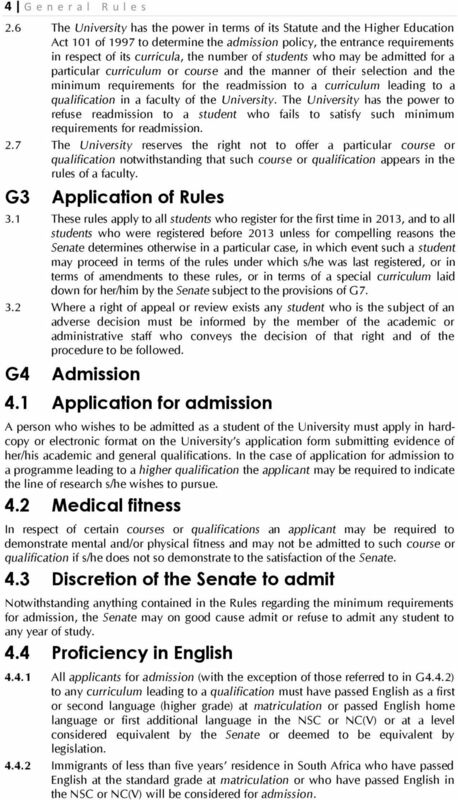 G3 Application of Rules 3.1 These rules apply to all students who register for the first time in 2013, and to all students who were registered before 2013 unless for compelling reasons the Senate determines otherwise in a particular case, in which event such a student may proceed in terms of the rules under which s/he was last registered, or in terms of amendments to these rules, or in terms of a special curriculum laid down for her/him by the Senate subject to the provisions of G Where a right of appeal or review exists any student who is the subject of an adverse decision must be informed by the member of the academic or administrative staff who conveys the decision of that right and of the procedure to be followed. G4 Admission 4.1 Application for admission A person who wishes to be admitted as a student of the University must apply in hardcopy or electronic format on the University s application form submitting evidence of her/his academic and general qualifications. In the case of application for admission to a programme leading to a higher qualification the applicant may be required to indicate the line of research s/he wishes to pursue. 4.2 Medical fitness In respect of certain courses or qualifications an applicant may be required to demonstrate mental and/or physical fitness and may not be admitted to such course or qualification if s/he does not so demonstrate to the satisfaction of the Senate. 4.3 Discretion of the Senate to admit Notwithstanding anything contained in the Rules regarding the minimum requirements for admission, the Senate may on good cause admit or refuse to admit any student to any year of study. 4.4 Proficiency in English All applicants for admission (with the exception of those referred to in G4.4.2) to any curriculum leading to a qualification must have passed English as a first or second language (higher grade) at matriculation or passed English home language or first additional language in the NSC or NC(V) or at a level considered equivalent by the Senate or deemed to be equivalent by legislation Immigrants of less than five years residence in South Africa who have passed English at the standard grade at matriculation or who have passed English in the NSC or NC(V) will be considered for admission. 16 G e n e r a l R u l e s Notwithstanding G4.4.1 and G4.4.2, the Senate may recognise any English Language proficiency test, for example, the International English Language Testing System (IELTS) with a minimum test score of seven for admission. In exceptional cases, the Test of English as a Foreign Language (TOEFL) may be recognised by the University with a minimum test score of 600 for admission. G4.4.3 A pass in English at the General Certificate of Secondary Education (GCSE), the International General Certificate of Secondary Education (IGCSE), or the General Certificate of Education (GCE) Ordinary level is considered equivalent to a pass in English at NSC or NC(V) level or at the higher grade at matriculation level. 4.5 Faculty or qualification-specific requirements In addition to satisfying the minimum admission requirements of the University, an applicant must satisfy any additional requirements of the faculty to which s/he seeks admission. 4.6 Certificate of good conduct A student who was registered at any other university, must upon application for admission to this University, submit a certificate of good conduct and an academic transcript issued by that university or those universities, which satisfies the Senate that s/he is a person of good standing. 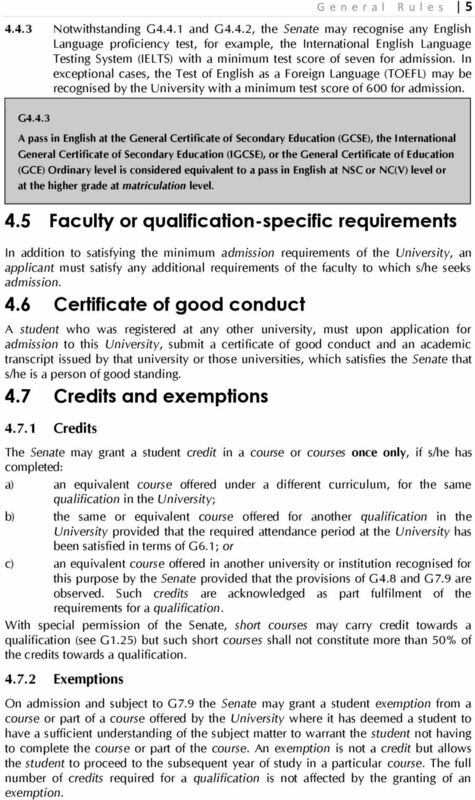 4.7 Credits and exemptions Credits The Senate may grant a student credit in a course or courses once only, if s/he has completed: a) an equivalent course offered under a different curriculum, for the same qualification in the University; b) the same or equivalent course offered for another qualification in the University provided that the required attendance period at the University has been satisfied in terms of G6.1; or c) an equivalent course offered in another university or institution recognised for this purpose by the Senate provided that the provisions of G4.8 and G7.9 are observed. Such credits are acknowledged as part fulfilment of the requirements for a qualification. 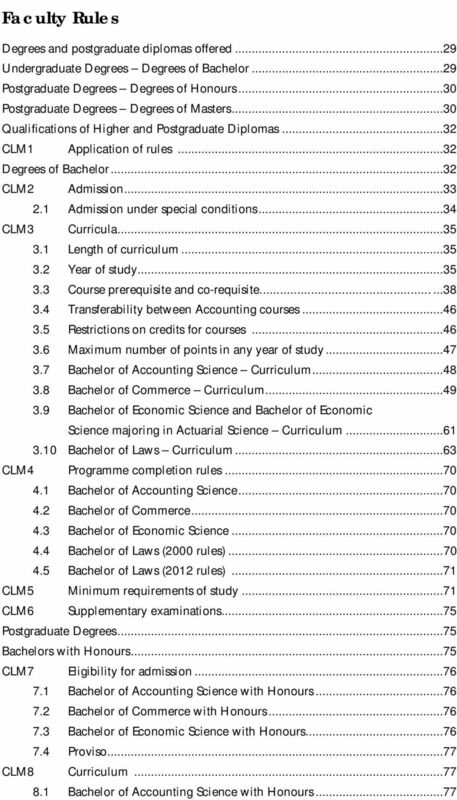 With special permission of the Senate, short courses may carry credit towards a qualification (see G1.25) but such short courses shall not constitute more than 50% of the credits towards a qualification Exemptions On admission and subject to G7.9 the Senate may grant a student exemption from a course or part of a course offered by the University where it has deemed a student to have a sufficient understanding of the subject matter to warrant the student not having to complete the course or part of the course. An exemption is not a credit but allows the student to proceed to the subsequent year of study in a particular course. The full number of credits required for a qualification is not affected by the granting of an exemption. 18 G e n e r a l R u l e s 7 A National Certificate (Vocational) NC(V) with the formal recognition by Umalusi from 2009 in terms of any law, of the capacity of a vocational student to enter a university for the degree of bachelor. OR Matriculation in the form of a university entrance examination or a matriculation endorsement from Umalusi or the granting of complete or conditional matriculation exemption by the Matriculation Board of Higher Education South Africa (HESA). The date of validity of the NSC, NC(V), matriculation certificate, matriculation endorsement, or certificate of exemption from the matriculation examination must precede 2 April of the academic year for which admission is sought, notwithstanding that the certificate may be issued at a later date Certificate of conditional exemption on recommendation of the Senate An applicant must be issued a certificate of conditional exemption by Matriculation Board of HESA if that applicant, in the opinion of the Senate has demonstrated, in a selection process approved by the Senate, that s/he is suitable for admission to the University. Where the Senate certifies that the holder of a certificate of conditional exemption issued in terms of this paragraph has completed the normal requirements of the curriculum for the first year of study of any qualification, the Matriculation Board of HESA must issue a certificate of complete exemption to her/him, dated from the first day in January of the year in which the first degree credit was obtained. An applicant may be registered for a course under this rule only if places are available for that course. 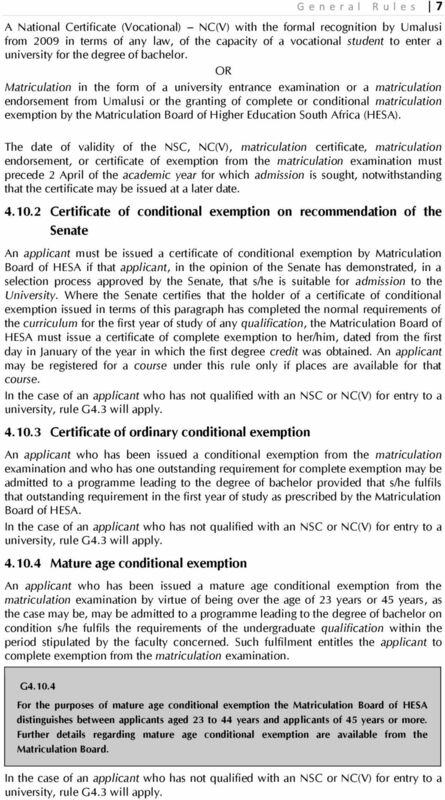 In the case of an applicant who has not qualified with an NSC or NC(V) for entry to a university, rule G4.3 will apply Certificate of ordinary conditional exemption An applicant who has been issued a conditional exemption from the matriculation examination and who has one outstanding requirement for complete exemption may be admitted to a programme leading to the degree of bachelor provided that s/he fulfils that outstanding requirement in the first year of study as prescribed by the Matriculation Board of HESA. In the case of an applicant who has not qualified with an NSC or NC(V) for entry to a university, rule G4.3 will apply Mature age conditional exemption An applicant who has been issued a mature age conditional exemption from the matriculation examination by virtue of being over the age of 23 years or 45 years, as the case may be, may be admitted to a programme leading to the degree of bachelor on condition s/he fulfils the requirements of the undergraduate qualification within the period stipulated by the faculty concerned. Such fulfilment entitles the applicant to complete exemption from the matriculation examination. G For the purposes of mature age conditional exemption the Matriculation Board of HESA distinguishes between applicants aged 23 to 44 years and applicants of 45 years or more. Further details regarding mature age conditional exemption are available from the Matriculation Board. In the case of an applicant who has not qualified with an NSC or NC(V) for entry to a university, rule G4.3 will apply. 19 8 G e n e r a l R u l e s Holder of a three-year diploma An applicant who has passed school Grade 12, but who did not obtain a matriculation exemption, an NSC or an NC(V) to enter university, and who has completed a threeyear diploma from a university, university of technology, teachers training college, nursing college or a franchised or associated technical or community college recognised by the Senate for this purpose may be admitted to a programme leading to the degree of bachelor on condition that s/he fulfils the requirements of the undergraduate qualification within the period stipulated by the faculty concerned. Such fulfilment entitles the applicant to complete exemption from matriculation, the NSC or the NC(V) Immigrant conditional exemption Subject to G4.4, a person who has resided in South Africa for less than five years and who has been issued with a conditional matriculation exemption by reason of not having passed a second language at higher grade in the school-leaving examination at a South African school, may be admitted to a programme leading to the degree of bachelor, on condition that s/he completes a second language course at higher grade or NSC or NC(V) or university level within the period stipulated by the faculty concerned. The qualification cannot be awarded until this condition has been fulfilled Foreign conditional exemption An applicant from a foreign country who has been issued a conditional exemption from the matriculation examination by the Matriculation Board of HESA may be admitted to a programme leading to the degree of bachelor on condition that s/he fulfils the requirements of the undergraduate qualification within the period stipulated by the faculty concerned. Such fulfilment entitles the applicant to complete exemption from the matriculation examination. 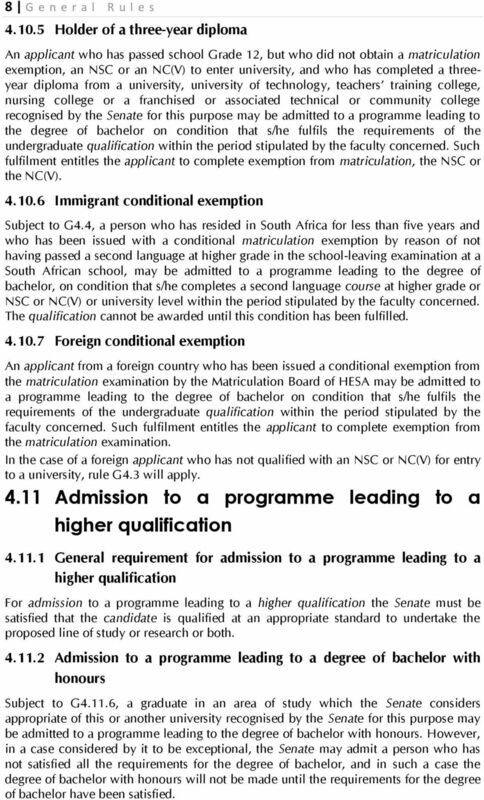 In the case of a foreign applicant who has not qualified with an NSC or NC(V) for entry to a university, rule G4.3 will apply Admission to a programme leading to a higher qualification General requirement for admission to a programme leading to a higher qualification For admission to a programme leading to a higher qualification the Senate must be satisfied that the candidate is qualified at an appropriate standard to undertake the proposed line of study or research or both Admission to a programme leading to a degree of bachelor with honours Subject to G4.11.6, a graduate in an area of study which the Senate considers appropriate of this or another university recognised by the Senate for this purpose may be admitted to a programme leading to the degree of bachelor with honours. However, in a case considered by it to be exceptional, the Senate may admit a person who has not satisfied all the requirements for the degree of bachelor, and in such a case the degree of bachelor with honours will not be made until the requirements for the degree of bachelor have been satisfied. 20 Admission to a postgraduate diploma or certificate G e n e r a l R u l e s 9 Subject to G4.11.6, a graduate in an area of study which the Senate considers appropriate of this or another university recognised by the Senate for this purpose may be admitted to a programme leading to a postgraduate diploma or certificate. 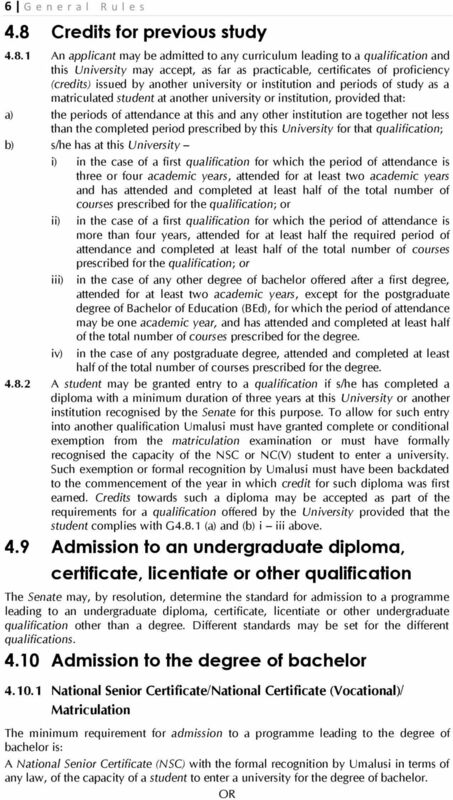 However, in a case considered by it to be exceptional, the Senate may admit as a student a person who has not satisfied all the requirements for the degree of bachelor, and in such a case the award of the postgraduate diploma or certificate will not be made until the requirements for the degree of bachelor have been satisfied Admission to a programme leading to the degree of master Subject to G4.11.6, a graduate of this or another university recognised by the Senate for this purpose may be admitted to a programme leading to the degree of master if s/he holds a qualification in a field considered by the Senate to be appropriate and which can normally only be taken over not less than four years of full-time study; or if s/he holds more than one qualification both or all of which are considered by the Senate to be in an appropriate field, and for which the combined number of years of full-time study is not less than four years. 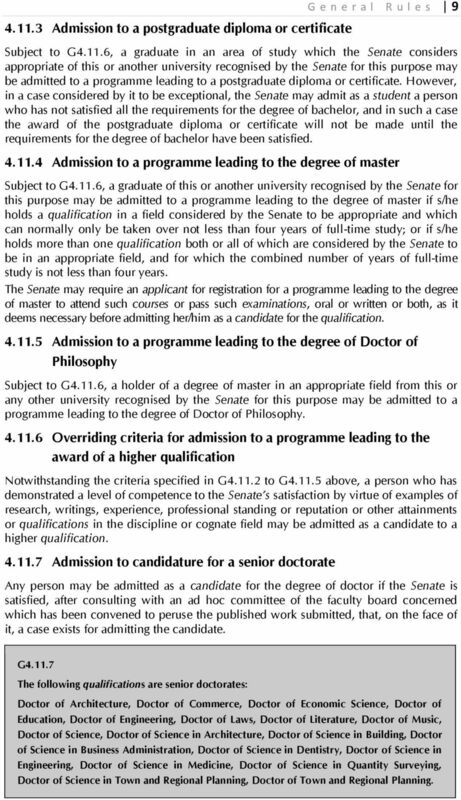 The Senate may require an applicant for registration for a programme leading to the degree of master to attend such courses or pass such examinations, oral or written or both, as it deems necessary before admitting her/him as a candidate for the qualification Admission to a programme leading to the degree of Doctor of Philosophy Subject to G4.11.6, a holder of a degree of master in an appropriate field from this or any other university recognised by the Senate for this purpose may be admitted to a programme leading to the degree of Doctor of Philosophy Overriding criteria for admission to a programme leading to the award of a higher qualification Notwithstanding the criteria specified in G to G above, a person who has demonstrated a level of competence to the Senate s satisfaction by virtue of examples of research, writings, experience, professional standing or reputation or other attainments or qualifications in the discipline or cognate field may be admitted as a candidate to a higher qualification Admission to candidature for a senior doctorate Any person may be admitted as a candidate for the degree of doctor if the Senate is satisfied, after consulting with an ad hoc committee of the faculty board concerned which has been convened to peruse the published work submitted, that, on the face of it, a case exists for admitting the candidate. G The following qualifications are senior doctorates: Doctor of Architecture, Doctor of Commerce, Doctor of Economic Science, Doctor of Education, Doctor of Engineering, Doctor of Laws, Doctor of Literature, Doctor of Music, Doctor of Science, Doctor of Science in Architecture, Doctor of Science in Building, Doctor of Science in Business Administration, Doctor of Science in Dentistry, Doctor of Science in Engineering, Doctor of Science in Medicine, Doctor of Science in Quantity Surveying, Doctor of Science in Town and Regional Planning, Doctor of Town and Regional Planning. 21 10 G e n e r a l R u l e s 4.12 Admission of occasional students A person, whether matriculated or not, may be permitted by the Senate to register for courses outside a recognised curriculum subject to such requirements and conditions as may be determined by the Senate. However, any such courses may not subsequently be granted as credits towards a degree unless the student had matriculated before commencing them. A student seeking credit towards a qualification in respect of a course taken for non-qualification purposes at this University or another institution must satisfy the Senate that: a) s/he is eligible for admission to the curriculum leading to the qualification; and b) the validity of the credit/s has not lapsed Admission of study abroad/ international occasional students Students of an institution recognised by the Senate for this purpose may be admitted to courses for non-qualification purposes. G4.13 Where an exchange agreement with such an institution exists fees may be waived on the basis of reciprocity. G5 Registration 5.1 Registration and renewal of registration Except with the permission of the Senate no person may attend any course or proceed as a candidate for any qualification unless s/he is registered as a student of the University at the material time. Registration is renewable annually or on such shorter period as the Senate may determine. Normally, an annual period of registration is from the date of registration in a particular year until the last day of registration in the first quarter of the subsequent year in the relevant faculty. 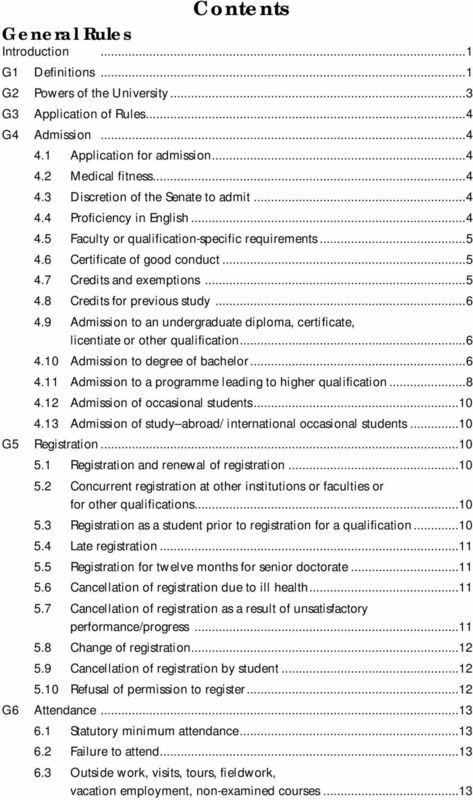 5.2 Concurrent registration at other institutions or faculties or for other qualifications A person who is registered as a student for any qualification may not be registered as a student for any other qualification or at any other faculty of the University or at any other tertiary education institution except with the approval of the Senate normally given in advance. Such approval will only be granted in circumstances considered exceptional by the Senate. 5.3 Registration as a student prior to registration for a qualification The Senate may permit or require a person, before being registered for a qualification, to register as an occasional student and attend courses for such period and pass assessments at the prescribed standard in such courses as the Senate may determine in her/his case. 22 G e n e r a l R u l e s Late registration Late registration, for which a fee may be charged, may be permitted by the Senate only in exceptional circumstances. G5.4 The last day for registration differs among faculties and among programmes. It is the responsibility of each student to find out from the relevant faculty office what the final day of registration is for her/his course and to register on or before that date. 5.5 Registration for twelve months for senior doctorate A candidate for a senior doctorate must be registered as a student of the University for at least twelve months before the qualification may be conferred. 5.6 Cancellation of registration due to ill health An applicant for registration in the first or any subsequent year of study may be required to satisfy the Vice-Chancellor that s/he is physically and mentally fit to carry out the work involved in that or any subsequent year of study, and may for this purpose be required to present herself/himself for, and submit to, any medical examination that the Vice-Chancellor may require in her/his case The Vice-Chancellor may suspend the registration of any student if s/he is satisfied that this step is warranted because of the student s physical or mental ill health. An appeal against such suspension may be made to the Council The Council may cancel the registration of any student because of her/his physical or mental ill health if it is satisfied after giving the student a proper opportunity to make representations (as defined in the Administration of Justice Act), that this step is warranted. 5.7 Cancellation of registration as a result of unsatisfactory performance/progress The Senate may cancel the registration of an undergraduate student in one or more but not all of the courses for which that student is registered in that year, if in the opinion of the Senate the student s progress is unsatisfactory or if the academic achievement of the student is such that s/he will not at the end of the year obtain credit in such course or courses. For this rule to be invoked the Head of School must ensure the criteria have been published in advance by which progress and/or academic achievement will be judged as the case may be. An appeal against such cancellation may be made in the first instance to the relevant Head of School. If the Head of School is unwilling to reverse her/his original decision, s/he shall forthwith place the student s representations and his or her own written comments before the Dean for a decision. In exceptional cases, the Dean may set up an appeal committee composed of two senior faculty members (one from the school concerned) nominated by her/him. The decision of the Dean or the appeal committee, as the case may be, shall be final. Fee implications associated with the cancellation of registrations are outlined in the Schedule of Fees books. 23 12 G e n e r a l R u l e s The Senate may cancel the registration of a postgraduate student registered for a programme by research if a higher degrees committee (or equivalent), on the recommendation of the relevant supervisor(s) and head of school, has considered the research proposal and/or other milestones of the research of that student and has judged the research proposal or the progress towards the milestones to be academically unsatisfactory or, in material aspects, incomplete. The higher degrees committee may appoint a panel comprising one member of the higher degrees committee, the relevant supervisor and the relevant head of school for the purpose of advising the higher degrees committee. Reasons must be given when such registration is cancelled and an appeal against such cancellation may be made to the Dean of the Faculty, who will then propose membership of an ad hoc committee to review the case. The three-person ad hoc committee will be chaired by the Dean. The Chairperson of the higher degrees committee; the Head of School and/or the Supervisor (or equivalent); may be in attendance. If the ad hoc committee does not permit renewal of registration the student has the right to submit a further appeal to Deputy Vice-Chancellor (DVC): Academic, who may consult with the Dean. The decision of the DVC: Academic, acting on behalf of the Council, shall be final. Fee implications associated with the cancellation of registrations are outlined in the Schedule of Fees books The process set out in will also apply to a postgraduate student registered for a programme which includes coursework. 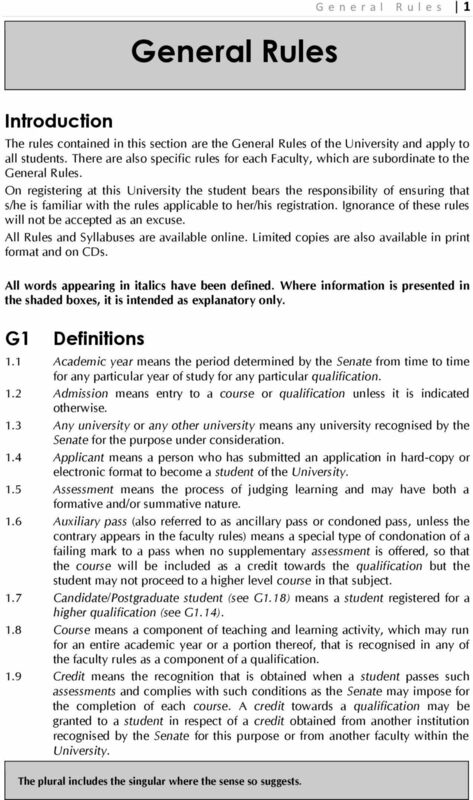 5.8 Change of registration In exceptional circumstances, where a first-year student is adjudged by the Senate to be making inadequate progress and the criteria by which such judgment is made have been published in terms of G5.7, the student may be permitted or required to alter her/his registration to a special curriculum for the same qualification. 5.9 Cancellation of registration by student Date of cancellation of registration for a qualification Unless in exceptional circumstances the Senate otherwise determines, a student who cancels her/his registration for a qualification less than one month prior to the commencement of the final examination session in which the assessment for that qualification are held, will be deemed to have failed in all the courses for which s/he was registered in that year, except for those courses which s/he has already completed Date of cancellation of registration in a particular course Unless the Senate otherwise determines, a student may not cancel her/his registration for a particular course less than one month prior to the commencement date of the final examination session in which the assessment for that course is held Refusal of permission to register A student who fails to complete a course may be refused permission by the Senate to register again for that course if admission to the course is limited or if s/he has registered more than once for that course. 24 G6 Attendance 6.1 Statutory minimum attendance G e n e r a l R u l e s 13 In terms of Joint Statute 16 the minimum period of attendance (i) for any degree of bachelor is three academic years. (ii) for the degree of bachelor with honours is: 1) one academic year provided the student has completed a degree of bachelor recognised by the Senate; or 2) where the programme leading to the degree of bachelor with honours is taken simultaneously with the programme leading to the degree of bachelor, at least one academic year in addition to the minimum period prescribed for the degree of bachelor concerned, provided that the Senate may in a case considered by it to be exceptional, reduce the minimum period of attendance in respect of a degree of honours in Bachelor of Arts, Bachelor of Science, or of Bachelor of Commerce to a total of three academic years. 6.2 Failure to attend Any student registered for any course who fails to fulfil the attendance requirements prescribed by the faculty for that course may be refused permission by the Senate to present herself/himself for assessment in that course. 6.3 Outside work, visits, tours, fieldwork, vacation employment, non-examined courses The requirements for any qualification or course may include such work or attendance whether within or outside the University and during term and/or vacation periods as the Senate may prescribe. A student is required to perform satisfactorily all duties required of her/him in this connection. Failure to comply with these requirements may result in the student being refused permission by the Senate to present herself/himself for examination, to register for the subsequent year of study or any particular year of study thereafter or ineligibility for the conferment of the qualification. 6.4 Exemption from attendance In exceptional circumstances where it is deemed appropriate, the Senate may excuse a student from attending all or part of a course. 6.5 Attendance requirement for students for qualification Any student for whom attendance is not otherwise prescribed by the rules is required to attend at the University for such period and in such manner as may be determined by the Senate. The Senate may waive this requirement in exceptional circumstances or in respect of members of the Convocation. 6.6 Limitation on the activity of a student for reasons of ill health Where s/he considers it necessary in the interest of any student or in the interests of the University, the Vice-Chancellor is entitled to investigate the physical or mental health of any student and to that end may require the student to obtain a medical report from or to submit to examination by a suitably qualified medical practitioner or psychologist acceptable to the Vice- Chancellor. Wits gives you the edge. REGULATIONS FOR THE DEGREES OF MPHIL AND PHD. These regulations are approved by Senate. They were most recently updated in July 2014. 1. Regulations for Professional Doctorate Qualifications. 1.1.1 These regulations apply to all Professional Doctorate degrees at Unitec. PROGRAMME REGULATIONS Professional Doctorate Regulations 1. Regulations for Professional Doctorate Qualifications 1.1 Summary 1.1.1 These regulations apply to all Professional Doctorate degrees at Unitec. 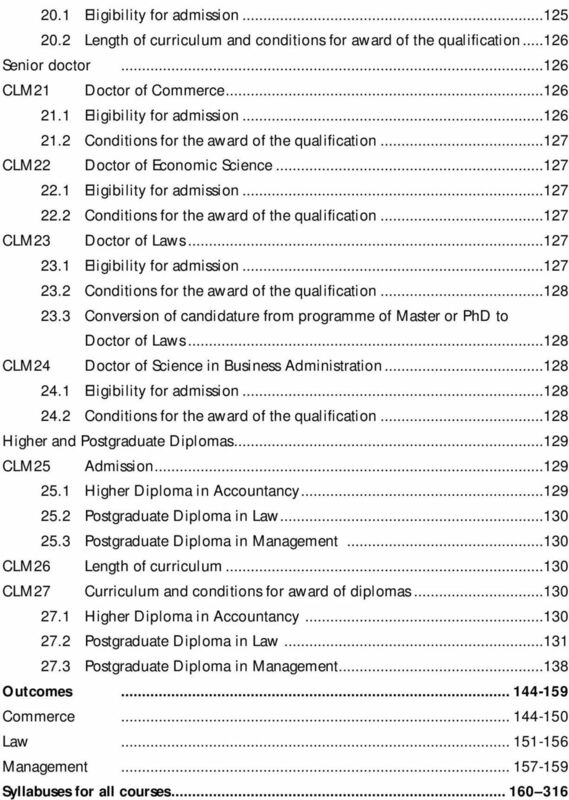 825 REGULATIONS FOR THE DEGREE OF DOCTOR OF PHILOSOPHY (PhD) (Applicable to students enrolled in or after September 2007. Regulations applicable to other students are available at the website: http://www.hku.hk/gradsch/web/regulations). REGULATIONS FOR HIGHER DEGREES BY RESEARCH Different regulations apply accding to students iginal date of enrolment f the degree. 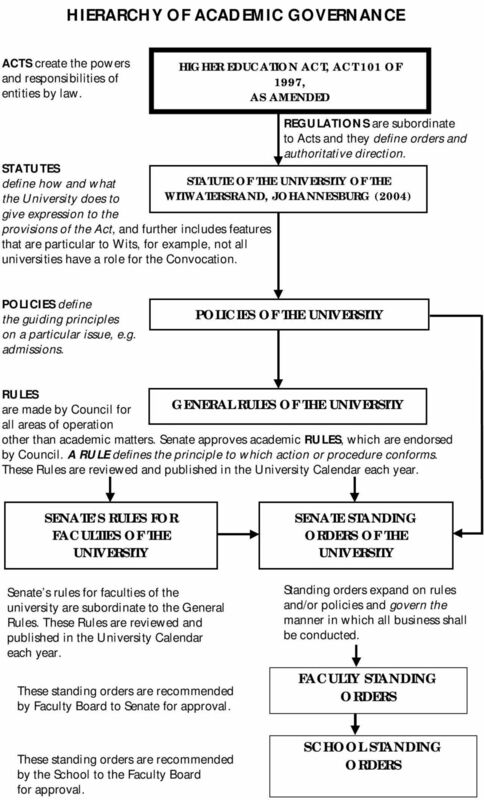 The regulations below apply to students who enrolled from 1 September 2007. Regulations for the Award of the Degrees of Master of Philosophy and Doctor of Philosophy 2014/15 September 2014 Notes 1. All sections of this document, including the annexes and forms, are available online. To qualify for the degree of Master of Philosophy, the student must pursue a supervised program of research leading to the submission of a thesis. MASTER OF PHILOSOPHY On-Campus; Online MPHIL AQF 9 OVERVIEW The Master of Philosophy (MPhil) is a higher degree by research which aims to develop students independent research skills under academic supervision. approval of the University Court, has the power to make regulations on any matters in order to give effect to these instruments. Fee Rules 2014. Updated 28 November 2013. Name of Rules These rules are the Fee Rules 2014. Commencement These rules commence on 1 January 2014. Risk Implications There are no material risks to the University associated with the approval of these amendments. 4. The criteria for the award of the Degree of PhD (by Published Works) shall be the same as those established for the Degree of PhD by Research.